When taking a quick breather or just enjoying the scenery, comfort is important and necessary when bench seating its concerned. The contoured seat helps take pressure off body points, allowing for an overall more enjoyable outdoor experience for guests, this helps elongate stay times and encourages more repeat visits. The precast concrete construction with steel rebar reinforcement establishes strength and durability, ensuring top-of-the-line performance in all-weather conditions. 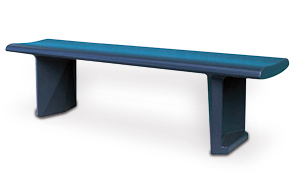 The subtle stylings of the contoured concrete backless bench provide traditional look while accenting the current beauty of any space.